Gerrymandering is a type of voter fraud involving the manipulation of district boundaries to create a partisan advantage. Redrawing voting lines can be used to give an advantage to a party or person. This advantage can be gained by redrawing district lines to increase the number of Congressional Seats that are likely to be won by one party or by decreasing the number of seats that are likely to be won by the opposing party. Attempting to decrease the number of seats likely to be one by the opposing party is called “packing” because its intention is to “pack” as many of the other parties supporters into the smallest number of districts. In the US redistricting is done by a state legislators and is based on the census. That being said, the census is used only to ensure that each state has the appropriate number of seats in House of Representatives (this is called “reapportionment”) and does not effect how a state’s legislators choose to redistrict. Example: A particular party may gerrymander a voting map to draw lines in such a way that would ensure supporters of the party were spread out in order to win districts the party would win districts they would not have previously won. 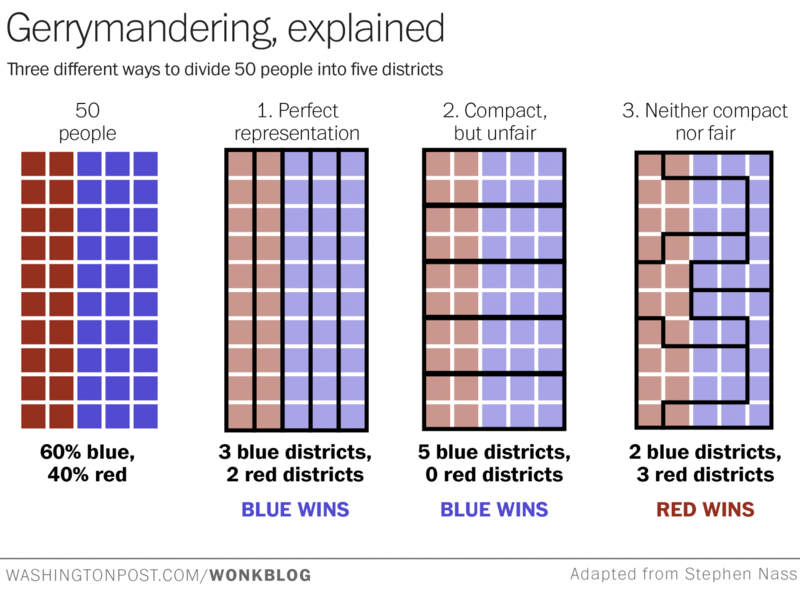 Gerrymandering can occur in a number of different ways. It can target groups or individuals. 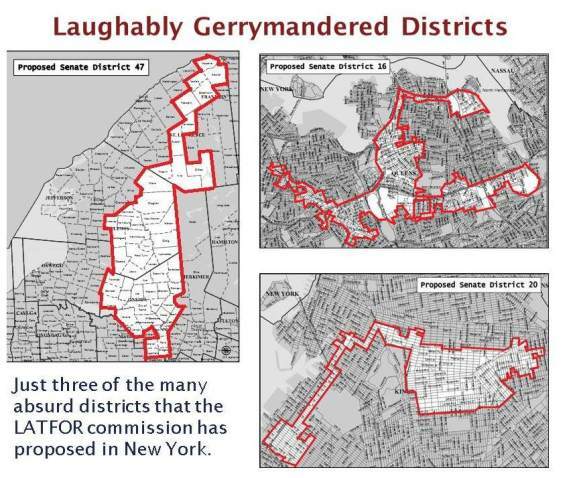 Regardless of it’s intention, many instances of redistricting in the United States have been used in a number of ways. In retrospect, some instances can be seen as voter fraud. Proposed redistricting in New York within New York City in 2012. The term Gerrymandering comes from the name of Governor Elbridge Gerry of Massachusetts. His administration enacted a law in 1812 defining new state senatorial districts. It’s actually pronounced Gerry with a “G”, but today we pronounce it Jerry with a “J”. In 1964 the Supreme Court ruled against gerrymandering and stated that districts should be drawn to reflect substantial equality of population. However, gerrymandering continues to be a pretty big problem up to this day (2015). After extensive “redistricting” in 2010 in many states, Republicans gained an advantage in the 2014 midterm elections. In Pennsylvania’s 2014 Midterm election 44% of all votes cast were for Democrats and 55% were for Republican. Despite this, only 5 Congressional Seats were won by Democrats and 13 were won by Republicans in Pennsylvania, or only 28% of the total Congressional Seats up for election. In North Carolina’s 2014 Midterm election as well, 44% of all votes cast were for Democrats and 55% were for Republicans. Despite this, only 3 Congressional Seats were won by Democrats and 10 were won by Republicans in North Carolina, or only 23% of the total Congressional Seats up for election.